Since 1865, Wellington, located on the southwestern tip of North Island, has served as the capital city of New Zealand. New Zealand's Parliament Building in Wellington. New Zealand is located in the southwest of the Pacific Ocean, approximately 900 miles east of Australia. It is comprised of various islands, the biggest of which are the North and South Islands. Its total land area is 103,483 square miles, and it has a population size of 4,730,480. The type of government in New Zealand is a constitutional monarchy with a representative parliament. The executive branch is headed by the British monarch, Queen Elizabeth II. The monarch appoints a Governor-General as the representative Head of State. The Prime Minister acts as the Head of Government and administers the Cabinet. Cabinet members are also Parliament members and responsible for answering to Parliament. 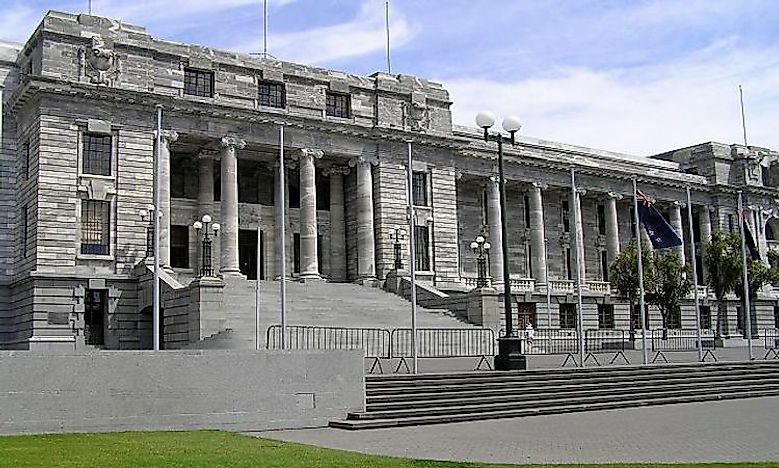 The legislative branch of New Zealand consists of Parliament, which is also known as the House of Representatives. What Were The Former Capital Cities Of New Zealand? European explorers began arriving in the late 17th century, and by 1788, New Zealand was considered part of the colony of New South Wales in Australia. It did not have its own capital until 1840 when Okiato held the distinction. This city was only the capital for one year. With New Zealand under British rule, the Lieutenant-Governor wanted to establish a new, permanent political center in Auckland. The land was purchased from the Maori, and a Government House was built. In 1842, the first Supreme Court was built here as well. Discussions about moving the capital to a new, more central location began with the first meeting of Parliament in the middle of the century. The problem for many of the officials was that Auckland was not a very centralized location. In addition, the Government Building had burned, leaving the government officials to hold parliamentary sessions in a building of poor conditions. After around ten years of discussion, the capital was finally moved to Wellington in 1865. What Is The Present Capital City Of New Zealand And Where Is It Located? Today, the capital of New Zealand continues to be in Wellington. This city is the most populated in the country, with 405,000 residents. It is located at the most southwestern point of North Island, and the entire metro area covers approximately 536 square miles. The Maori peoples have been inhabiting this area since at least the 13th century, although some evidence suggests it may have been as early as the 10th century. European settlers began arriving between 1839 and 1840. As the population grew, so did the infrastructure of the city. When the previously mentioned discussions began about where to move capital, the residents of Wellington invested in the Wellington Provincial Council Buildings to help influence the decision. These buildings were in much better condition than the previously mentioned government house located in Auckland. The first parliamentary session here took place on July 26, 1865. Today, Wellington continues to hold an important role as the capital of the country. Here, the country’s Supreme Court, Ministries, Departments, and Parliament can be found. Additionally, the majority of foreign embassies are located in Wellington. This city is an important cultural and economic center that received numerous tourists every year. It has also been ranked as having one of the highest qualities of life in the world. What Are The Religious Beliefs In New Zealand?